Trichlormethiazide and dexamethasone (Tri Dex) combination is an oral product that was licensed and marketed under the brand name of Naquasone® as a treatment for udder edema in the cow. Many veterinarians use this drug combination in horses to reduce mild swellings, particularly of the legs. Trichlormethiazide is a diuretic that works at the level of the proximal tubules of the kidneys to decrease the reabsorption of sodium. It has little effect on potassium excretion. Dexamethasone is a corticosteroid. A full discussion of the anti-inflammatory effects and side effects associated with dexamethasone are discussed in the dexamethasone monograph. One of the benefits of using a combination product is that each component works by a different mechanism. This may allow a smaller dose of the individual drugs than might be used if the drug were given individually. Tri Dex has been used by equine practitioners to treat mild swellings of the distal limbs. Because of the relatively small dose of the individual drugs, it generally is thought to be a safe product for bumps, bruises, non-specific edema, or stocking up. It sometimes is used in conjunction with antibiotics in leg wounds where there is both a bacterial component, and inflammation or contusion. Tri Dex does not cure the underlying cause of the swelling or edema and should not be used without appropriate diagnostic evaluation. Dexamethasone is a corticosteroid. All of the potential side-effects of corticosteroids should be reviewed and considered. 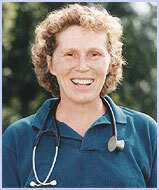 Of particular importance in the horse are considerations regarding laminitis and immune suppression. Trichlormethiazide is a diuretic and causes the loss of water and sodium chloride. Free access to water and salt are important at all times. Tri Dex can mask the signs of infection because of the corticosteroid's anti-inflammatory action. Tri Dex should not be used in any horse that is prone to laminitis due to the dexamethasone. Pony breeds may be more susceptible to some side-effects of corticosteroids, particularly laminitis. Drugs containing corticosteroids generally are not recommended in pregnant animals because in some species, corticosteroids may cause premature labor and birth defects. The drugs contained in Tri Dex are excreted in milk therefore it should not be used in pregnant or lactating mares unless the benefits outweigh the risks. Tri Dex would be used rarely in foals due to possible immune-suppression from corticosteroids. Tri Dex should not be used in horses with pituitary pars intermedia dysfunction (equine Cushing's Syndrome or pituitary hypertrophy/adenoma). Tri Dex should not be used at the same time as other corticosteroids or diuretics. Dexamethasone: Short-term administration is unlikely to cause serious harmful systemic-effects due to adrenal suppression but laminitis is always an area of concern with an overdose of corticosteroids. Trichlormethiazide: Electrolyte depletion and dehydration are possible with prolonged use or overdose of diuretics.